Tall and spindley, about 30 inches high. 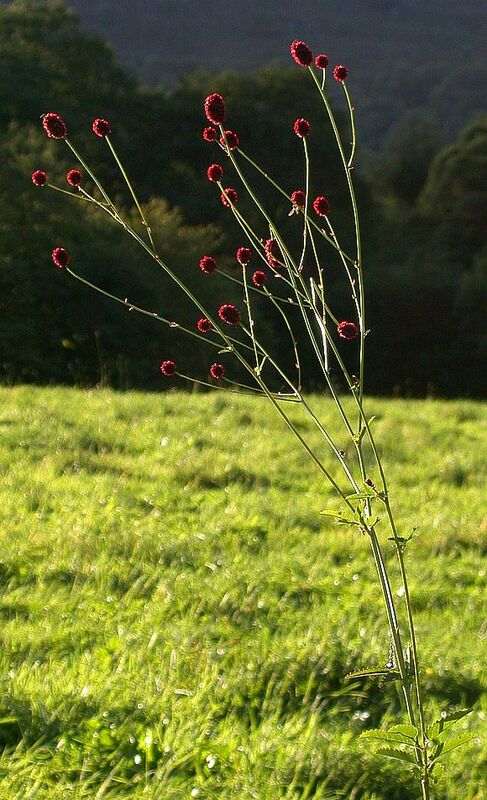 Dark brown/red flower heads atop branched stems. The stem leaves are few. Flowers not ready to open as yet. 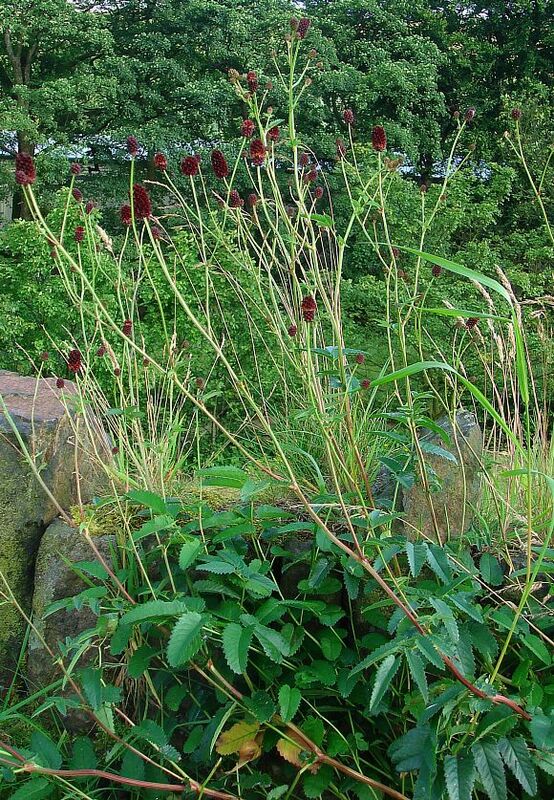 Each one has a pointed brown bract below it. The four petals open revealing four dark-purple stamens within. Stems fluted, sometimes square (image below). 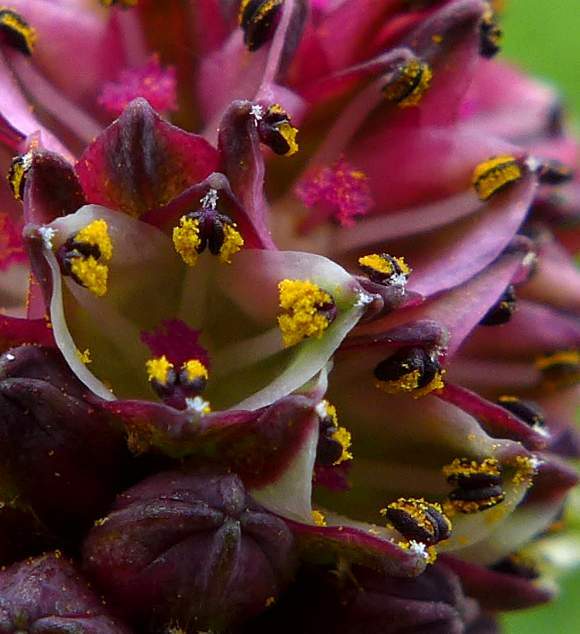 The four stamens are appressed into the central fold of the four tepals (which are dark purple on the outside, but sometimes white on the inside. 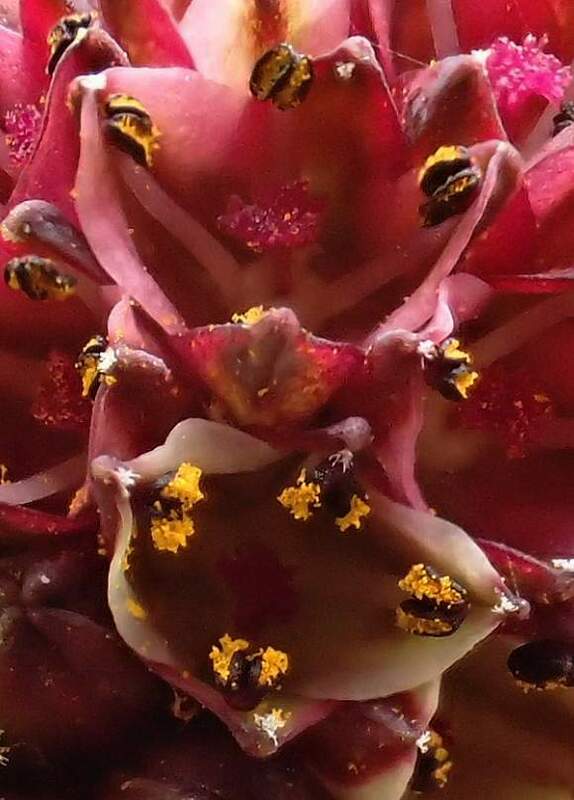 The florets further down the inflorescence have not yet opened; only the four tightly closed tepals can be seen. The tepals have a central rib which becomes more prominent near the end where they bend over to meet in the centre. The four styles appressed against the inside central ribs of the tepals, each with a deep-purple anther and deep yellow pollen. Poking slightly out right at the tip of each central tepal rib is a 'brush' of very short white hairs; these are not sexual organs. The style is also white and terminates in a pink papillate style. The short white brush-like hairs protruding from the ribs at the end of each tepal are plainly seen here just being the anthers, as if to tickle them. Your Author does not know their function, but they are not female sexual organs, that is lower down in the centre. The ribs of the tepals can be clearly seen on the unopened floret (bottom left). All florets are bisexual with pink style deeper inside the flower in the centre. Leaves typical of those plants belonging to the Roseaceae family. 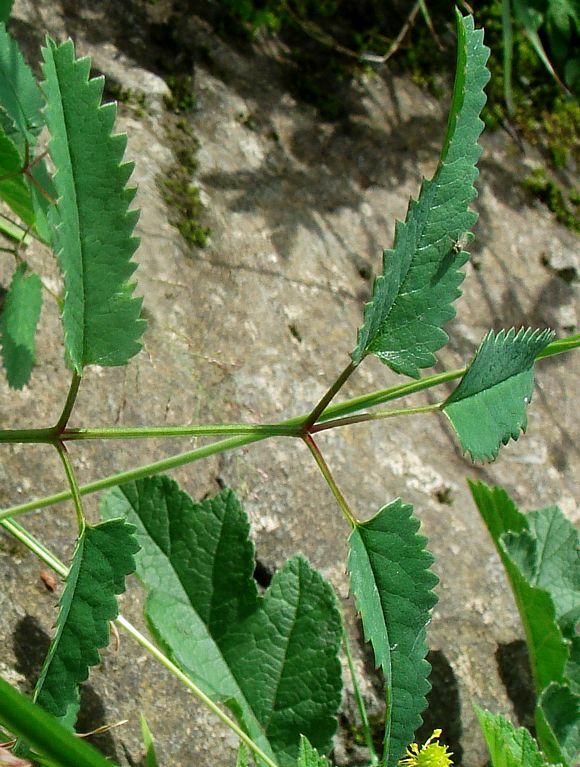 The leaves are pinnate, with pronounced forwardly-directed triangular teeth. Leaf teeth are terminated by dark-red tips. Another stem has decided to proliferate from near the summit of this plant. This does not seem to be one of the ordinary branches of which there are usually many, since it is not of similar thickness. 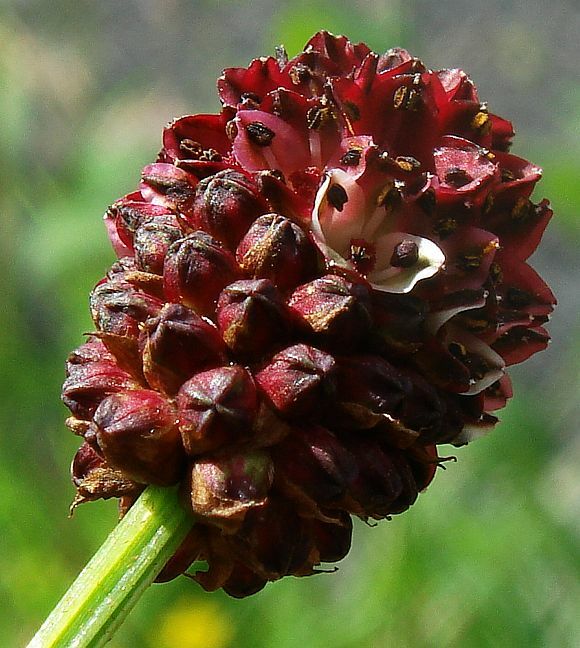 Distinguishing Feature : The flowers are all clustered together in a hard deep-red or nearly brown prolate spherical head. The leaves are typical rose-type, but but much narrower and slightly longer than typical members of the rose family. Like the rose family, the leaves are conspicuously coarsely toothed. 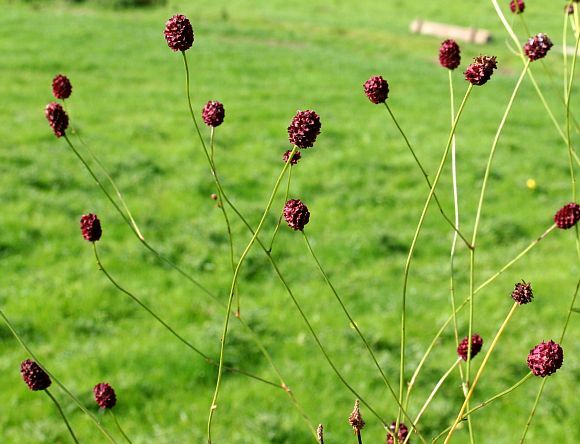 Unlike most members of the rose family, Great Burnet has only four petals, not five. 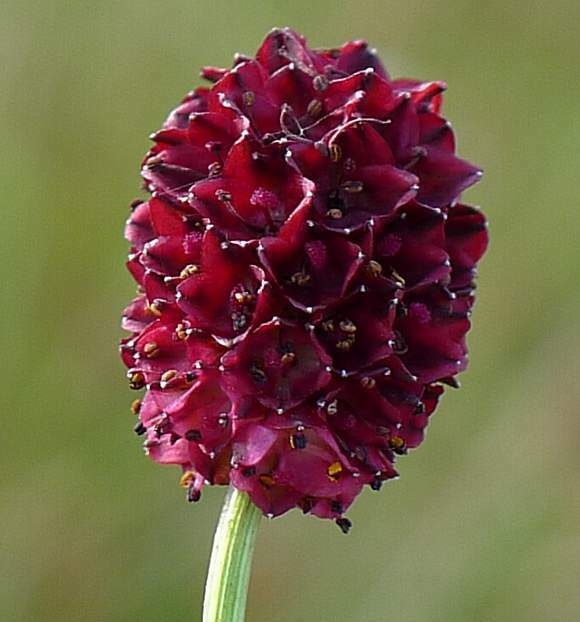 The flowers are all clustered together in a hard deep-red or nearly brown prolate spherical head. An asymmetrical dimeric Ellagitannin called Sanguiin H-6 which is an isomer of Agrimoniin which is found in Agrimony (Agrimonia eupatoria). Sanguiin H-6 is a dimer of Casuarctiin , another ellagitannin containing units of Sanguisorbic Acic . 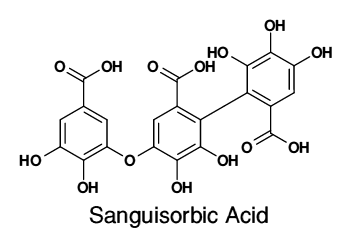 Sanguisorbic Acid is a constituent of some of the many hundreds of ellagitannins, which assemble themselves almost at will from Gallic Acid moieties or Galloyl (aka GlucoGallin ) units, which are the Glucoside s of Gallic Acid. 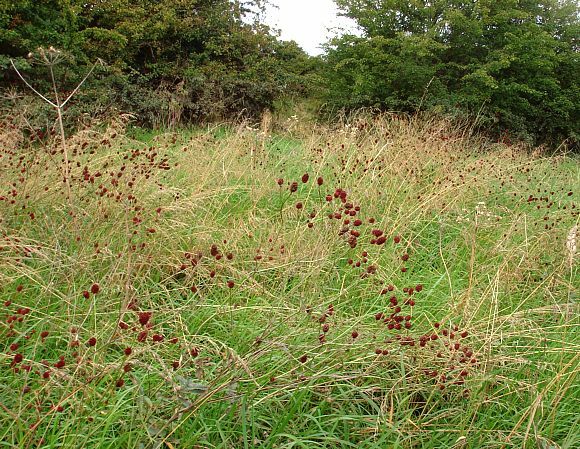 Your Author assumes it is not called Sanguisorbic Acid for nothing, and that it is also found in both Great Burnet and White Burnet . 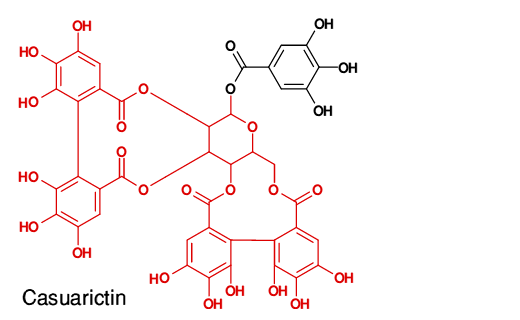 Casuarictin is another ellagitannin which is formed from four Gallic Acid units (red - the bottom pair and left-hand side pair) which together make two HexaHydroxyDiphenic Acid moiety linked by a Glucose unit (red, centre with a oxygen unit in the ring). The glucose unit is directly joined to a fifth Gallic Acid unit (black, top). 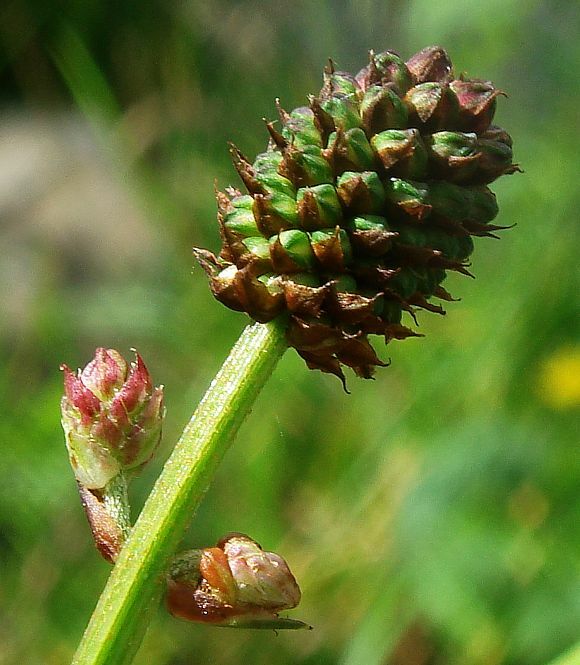 It is produced in some plants (Casuarina and Stachyurus species, which are not native to the UK, and probably within Great Burnet) from its precursor Tellimagrandin II. Note that these two Gallic Acid units, in joining with Glucose make two large rings, one 10 membered ring (on the left) and the other an 11-membered ring (just below centre). 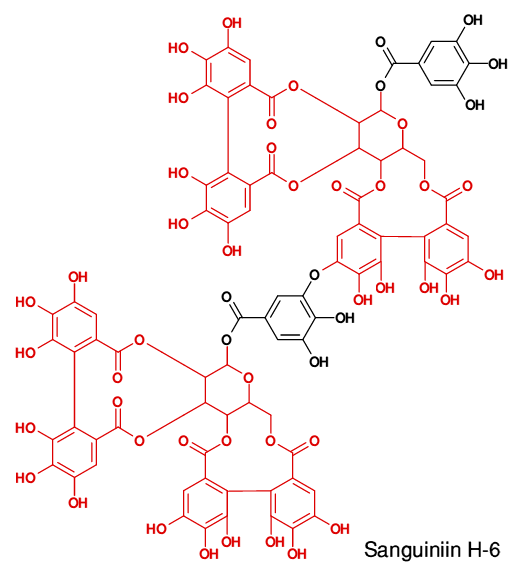 Sanguiniin H-6 below is the dimer of Casuarictin, and is also found in Great Burnet, Garden Strawberry (Fragaria ananassa), Raspberry (Rubus idaeus), Cloudberry (Rubus chamaemorus) and in other Rosaceae family plants. 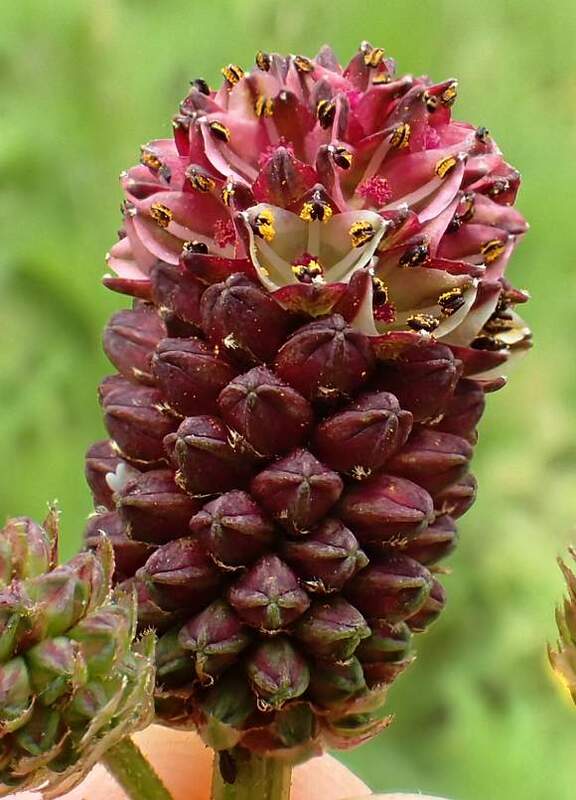 It is isomeric with agrimoniin which is found in Agrimony (Agrimonia eupatoria) which also belongs to the Rosaceae family.